Fall is the best time to do lawn maintenance. The soils are usually drier and not saturated with moisture – as commonly occurs in spring– making it easier to perform lawn maintenance activities such as over-seeding, mowing, dethatching and aeration. A No Mow Lawn requires minimal care, but there are a few steps that can be taken in the fall to improve turf quality and promote better growth the following spring. Fall is the best time to overseed any open areas that result from damage due to animals, construction activities, heavy traffic, or summer fungal diseases. The areas to be reseeded should be lightly worked up or scratched with a rake to expose the soil prior to seeding. The seed can be sprinkled into the open soil, raked in lightly, and firmed by stepping on the soil to firm it. Watering for the first 2 – 3 weeks helps stimulate germination and growth. Read “Over-Seeding your No Mow Lawn” (PDF) for detailed information on over-seeding. Fine fescue grasses tend to develop a thatch layer just below the soil surface due to the accumulation of dead root material over time. No Mow lawns that are rarely mowed also tend to develop a “mat” of dead grass material that can make a lawn appear “spotty” and not as full as a mowed lawn. This buildup of thatch slows the emergence of new growth in the spring, causing the unmowed fescue lawn to appear brown long after mowed lawns have greened up. 1) Dethatching – The thatch is removed manually using a dethatching rake, or with a machine that aggressively “combs” out the thatch from the grass. Dethatching is best done in fall, but is also effective when conducted in mid-spring. 2) Close Mowing – Late in the fall when night time temperatures have been below freezing for an extended period of time (November to early December), the No Mow lawn can be mowed close to the ground to clean away the year’s growth and remove the mat layer. This can be done by setting your mower on its lowest setting, or by using a string trimmer (weed whacker) to mow right down to the ground. The mowed material should be bagged during mowing or raked up afterwards. Close mowing should never be done during the growing season, as it will scalp the lawn and severely harm the fine fescue grasses. However, it can be done safely in late fall once the grasses enter winter dormancy. Close mowing in early spring is much more difficult, as the grass becomes matted down over winter, and is often wet and harder to mow. Lawns on heavy soils with a high clay content often suffer from compaction and poor air transfer to the roots, which require air to breathe and stay healthy. Aeration helps to open up these soils, promoting better root growth and an overall healthier lawn. Aeration is typically done using a machine that removes plugs of soil from the lawn. The resulting holes are then filled with a lighter material, such as a sand and compost mix. This promotes better air flow in the soil and healthier plant growth . Since the fine fescue grasses in the No Mow Lawn Mix grow best on well-drained sandy and loamy soils, compaction is usually less of an issue than on clay based soils, which are easily compacted. If your No Mow Lawn was seeded on a sandy soil, you should not have to worry about aerating your lawn. Sandy loam soils that are subjected to heavy foot traffic or vehicle use may become compacted, and require occasional aerating.vegetation must be killed or removed. Existing lawn grass, weeds, and other plants will compete with the No Mow seeds for nutrients, moisture, and sunlight. All perennial weeds must be eliminated prior to seeding. Perennial weeds such as quackgrass, bromegrass, thistles, creeping goldenrods and other aggressive plants will present a long-term problem if not controlled prior to seeding your No Mow turf. Annual weeds which are present in the soil as seeds can require your attention in early going (establishment stage), but should not pose a long-term threat. 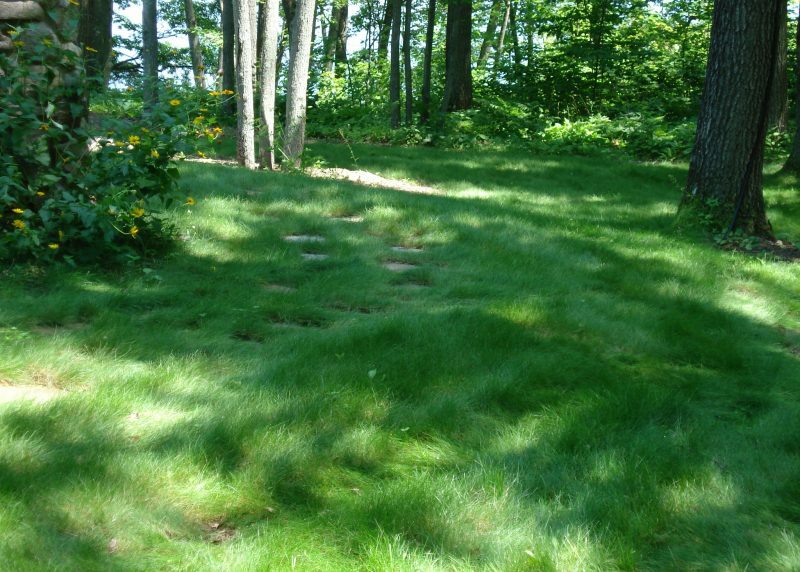 Since the fine fescue grasses in the No Mow Lawn mix are the most shade tolerant turf grasses available, they are often seeded in shady areas with trees in the overstory. If the leaves of deciduous trees are allowed to accumulate and mat down on the lawn, they will smother the grass. Oak leaves are particularly problematic, because they are high in tannins and are not readily broken down by soil micro-organisms. 1) Raking – Simply rake off the leaves once they have all fallen from the trees. This leaves a nice green carpet of No Mow that will green up ASAP in spring. 2) Use a mulching mower to finely chop up the leaves so they cannot mat down on the grass and smother it. It may require two or three passes with a mulching mower to chop up the leaves sufficiently. The needles of white pines and red pines do not harm the fine fescue grasses in the No Mow lawn. Spruce needles contain more complex organic compounds and break down more slowly, but generally will not harm an established No Mow lawn. The fine fescue grasses are particularly tolerant of the acid soil conditions that are created by the needles of conifer trees. Generally, we do not recommend using fertilizers on No Mow. Fine fescue grasses require only a minimum of Nitrogen. Never apply fertilizers that are high in Nitrogen. Nitrogen will promote lush leaf growth, but does not help build the all-important root system of the fescues in No Mow. Increased leaf growth hastens the formation of thatch, and requires more frequent mowing. The use of lawn fertilizers that contain Phosphorus are not allowed in many communities and near lakes and streams due to the negative effects on water quality and algae blooms. 1. Always test your soil before adding soil amendments. In most cases, the soil already has sufficient nutrients to support a fescue lawn. The addition of any fertilizer in such cases is a waste of time and money, and leads to unnecessary pollutants in runoff. 2. The best time to conduct a soil nutrient test is in late summer or early fall (late August to early September). This provides a good estimate of the soil nutrient conditions in advance of fall fertilizing. 3. Fall is the best time to apply fertilizer to lawns composed of cool season grasses, since these grasses have a strong late season growth spurt that builds their root systems for the following year. 4. Most loamy and sandy loam soils seldom require fertilizing, if ever. However, dry sandy soils are often acidic and have a low nutrient holding capacity. The first step in amending sandy soils is to check the pH to see if liming is necessary. Lime is essential in facilitating the availability of nutrients in the soil. Without first correcting the pH, the addition of fertilizer is a waste of time. 5. Fine fescues can sometimes benefit from the addition of Phosphorus and Potassium in early fall, if your soil is low in these nutrients. Acid soils can also benefit from fall-applied lime. Highly alkaline soils respond well when elemental sulfur is applied in fall to reduce the alkalinity of the soil. 6. A simple soil test for the following nutrients will determine what, if any additional nutrients your soil requires to grow a good lawn: pH (acidity – alkalinity), Calcium, Magnesium, Phosphorus, Potassium. 7. Certain soils may be low in trace elements such as Iron, Sulfur, Boron, Manganese, but this is rare. Tests for these micronutrients are also available. 8. Never apply fertilizers that are high in Nitrogen to your No Mow Lawn. Nitrogen promotes lush leaf growth, but does not help build the all-important root system of the fescues in No Mow. Increased leaf growth also hastens the formation of thatch, and requires more frequent mowing.